NEW! 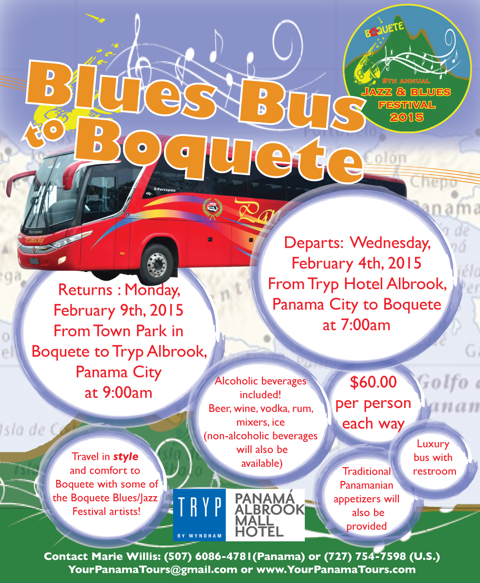 Take the Blues Bus to Boquete! This is another first for Panama, and maybe for all of Central America: A chartered luxury Blues Bus running from the Albrook Mall TRYP hotel in Panama City to Boquete and back, with one stop in Coronado! Take advantage of great discounts for festival visitors for your stay at the Tryp hotel (check details here! ), and then travel in style, with hot music, cool drinks and appetizers included! Let the party begin right there, on the bus! Meet some of the festival musicians on board! Check the poster below for more details. Call Marie Willis at 6086-4781 (Panama) or +1-727-754-7598 (US) for reservations.